St. Joseph Parish, Collingdale, is set to welcome Archbishop Charles Chaput who will celebrate the parish’s 100th Anniversary Mass on Feb. 6. Later that evening parishioners will throw a party for their centenary at Springfield Country Club. It almost wasn’t made a parish 100 years ago. 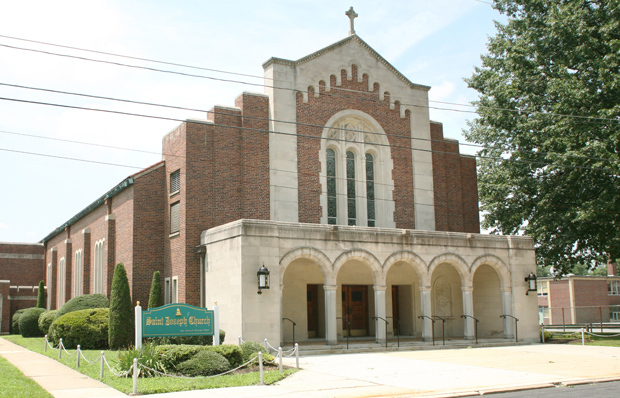 St. Joseph’s was originally intended to be a chapel of nearby Holy Spirit Parish in Sharon Hill, according to an archdiocesan history. However the population was growing so fast, at the last minute it was designated a parish itself. The pastor for the new parish was Father Otho Gromoll, one of a group of Episcopal priests who converted to Roman Catholicism in 1908. Ultimately eight were ordained as Catholic priests for the Archdiocese of Philadelphia, including Father Gromoll in 1911. The official first Mass for St. Joseph Parish was celebrated at the Collingdale Fire Hall on Feb. 16, 1916. As was then an archdiocesan custom, the first building erected was a combination church/school building with a free standing church to be erected only when that building was paid for. Groundbreaking was held on March 19, 1916, the Feast of St. Joseph and the first Mass celebrated in the church on Christmas Day, 1926. This also was not unusual but for a practical reason. A church property could be tax exempt if a liturgy was held before year end. The school opened the following September under the guidance of the Sisters Servants of the Immaculate Heart of Mary. Father Gromoll would serve the parish well until his death in 1945, when he was succeeded by an equally energetic priest, Father Andrew Lavin, who built the present church and served until 1980. Msgr. Charles McGroarty, who in retirement lives in the St. Joseph Rectory, was born and raised in the parish and credits his vocation to Father Lavin, as well as the priests who taught him at St. James High School in Chester. In his youth the church and an adjacent hall were still on the ground floor, while the classrooms were above. “It was a very good school,” he said. Pat Felker, a St. Joseph volunteer, today lives in what was once the McGroarty family home. She wasn’t born in the parish but her husband Don was, and she became a member when they married in in 1960. Don, a volunteer firefighter, died in the line of duty suffering an aneurysm while on an emergency call. Pat was left to raise their 10 kids, while operating a delicatessen. All of the Felker children went to St. Joseph School, where the faculty gradually transitioned from religious sisters to lay teachers. “I especially remember Sister Marie Andrew, who was the principal. She was excellent,” Felker said. At one point St. Joseph had the largest parish school in Delaware County but, as with so many others, it closed in 2010, and now the children go to various Catholic schools in the county. Father Thomas Sodano, who has been pastor for the past four years, estimates over the years St. Joseph has had 12,000 baptisms performed by 67 priests and 220 nuns taught in the school. At this time close to 1,000 families are members of the parish. St. Joseph Council 8924, Knights of Columbus, is extremely helpful with renovations of buildings, especially the former convent, which was utilized by visitors during the World Meeting of Families and for a women’s retreat. Also, largely through the Knights, the parish recently held a very successful carnival, the first in 20 years. Both spiritually and socially, things are definitely looking up, according to Father Sodano. I would love to join this church! I have 6 sons and they all graduated from St. Joseph’s School..I was a parishioner for 50 years until I moved a year ago!